Sprouts! … and a giveaway!!! Sprouts are the freshest greens you can have in your house on a regular basis and for pennies. 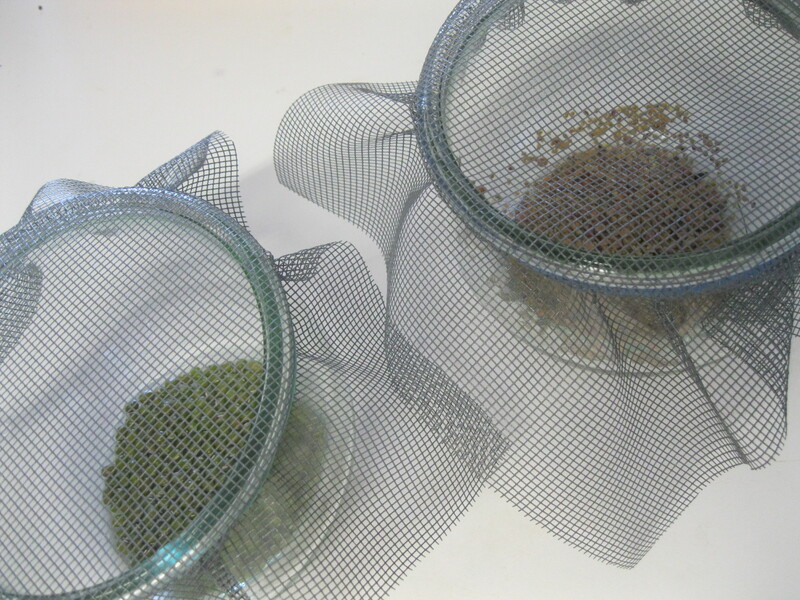 All you need is a jar, a rubber band, a piece of screen and some organic seeds for sprouting. 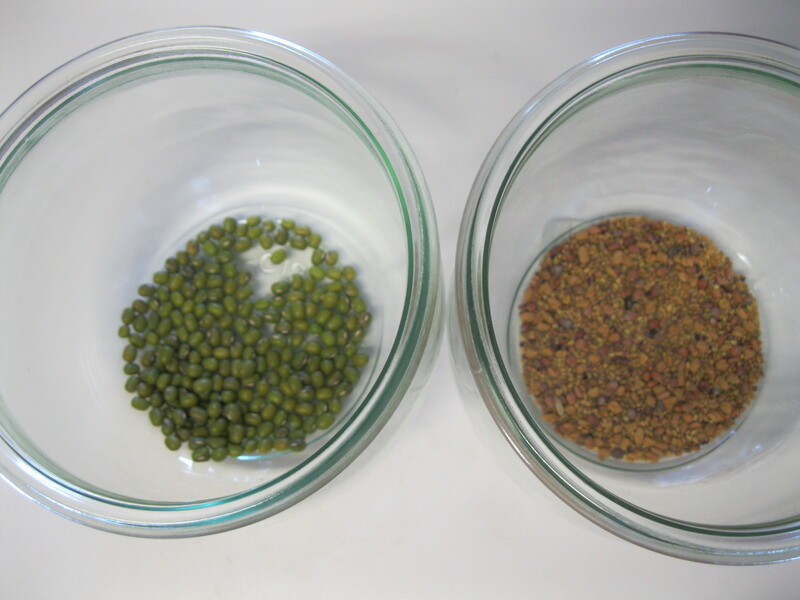 I’m using mung beans (left) and a spicy sprouting mix (right) that I got from my local farmer’s market. You don’t need a lot, they get big fast. Place the screen over the mouth of the jar and wrap the rubber band around it to hold the screen in place. Every day, at least once a day and preferably twice a day you’ll need to rinse the sprouts. To do this you’ll fill the jar with enough water to cover the spouts and empty it through the screen and into the sink. Do this 2-3 times. Don’t worry if they get stuck in the screen. They’ll be fine. Somebody accidentally ate the spicy sprouts before she remembered she needed them for a photo opportunity but here are the mung beans below. Then I’ll ask each of the randomly selected winners (3 in total) to email us their address and I’ll send you 2 bright shiny pieces of screen for your own jar of sprouts! Thanks to Somer at Good Clean Food for the brilliant idea! I don’t have a favorite-I love them all! My favorite way to use them is on a sandwich. Lettuce, tomatoes, onions, pickles, avocados, and sprouts. Yum! I love all sprouts, but any kind of sprouted bean is where it’s really at! oh bugger – I only just saw your post! (30 sept) – FYI the facebook thing works if you remove the “%7D” from the end of the URL! alfalfa are my faves for sarnies, but love fresh mung beans in stir-fries too. You have reminded me that I have NO idea where my sprouting tray is & that I MUST start sprouting again as the kids will love it! Thank you for that! I’m not the tech savvy one unless you’re talking biotech. I just got into the idea of making my own sprouts. 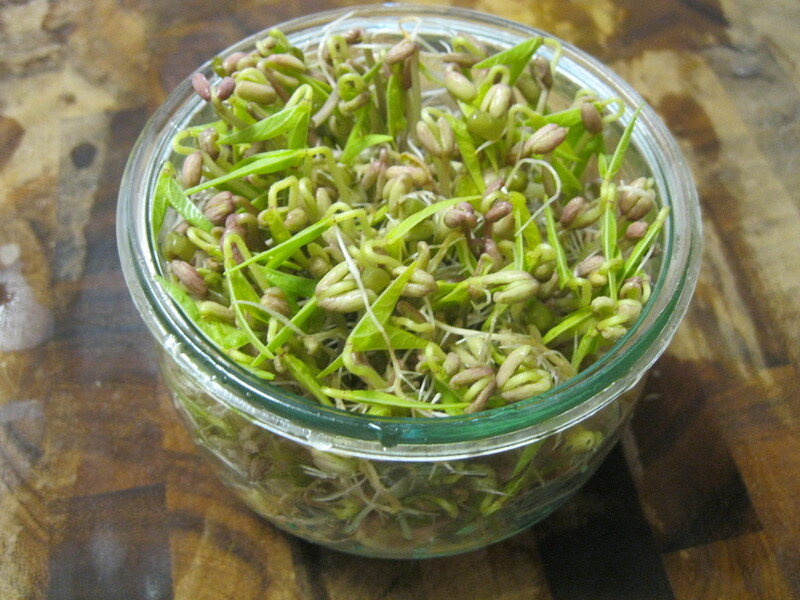 I have a recipe for an Indian Mung Sprout Salad that I really want to try out! I hope you’ll share… that sounds delicious!